All SAAKA bands are comprised of three layers of fabric creating our Dynamic Moisture Management System that continuously and efficiently pulls moisture from the skin surface through and to the outer layer for quick evaporation. The two outer layers of SAAKA are made from a high tech antimicrobial, poly/spandex microfiber with built in moisture management properties that create incredible wicking action. Our middle layer of SAAKA is highly absorbent, odor combatting, viscose from BAMBOO fabric that absorbs 30% more moisture than cotton. 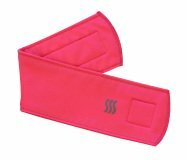 The two outer layers of all SAAKA sweatbands are made from an antimicrobial, poly/Spandex microfiber with built-in moisture management technology that enables its extreme wicking action. The core of all SAAKA's sport bands are a state of the art blend of viscose from BAMBOO. This unique technology in SAAKA's material absorbs 30% more moisture than cotton and resists odor-causing bacteria. Ankle Bands are ideal in helping prevent the flow of sweat into your shoes on long hot runs and during intense workouts. SAAKA sport bands last five times longer than conventional sweatbands. Our bands are reusable, washable, earth friendly, and made in the USA from sustainable high quality materials. If you have any questions about this product by SAAKA, contact us by completing and submitting the form below. If you are looking for a specif part number, please include it with your message.